Look what goodies were discovered and checked out at my local library. Paper to Petal by Rebecca Thuss and Patrick Farrell is a beautiful, beautiful book, filled with incredible handmade paper flowers. 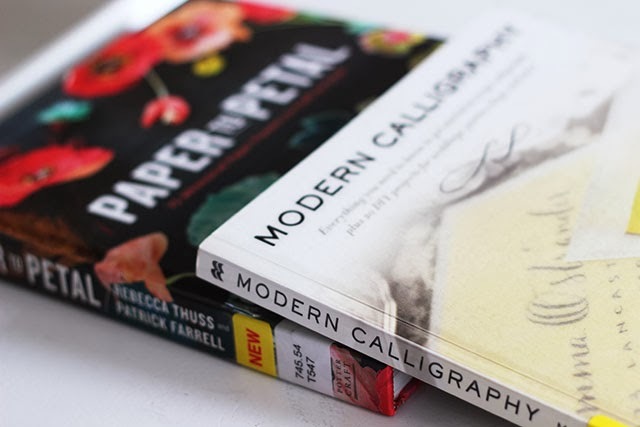 Modern Calligraphy by Molly Suber Thorpe feeds my desire to grow my calligraphy skills. I've actually completed a few of my own projects since checking these books out. Both of these books have been fun and inspiring, but I must return them tomorrow so that they can work their magic and inspire someone else. What inspiring books have you checked out lately?